Hi Everyone!! This is my first project I've posted and my first challenge. Lots of firsts. I'm from Kansas City. Now, I was unsure of what to do this challenge on. I thought.. potholes .. stock houses... fountains... JAZZ! 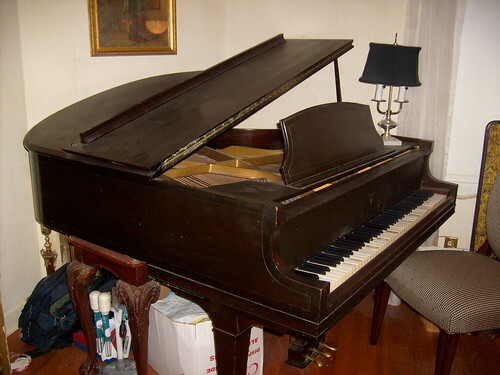 Since, music is a big part of my life ( I play piano and sing), I thought I would choose this. Kansas City is known for its JAZZ. My friend also wrote a journalism story about JAZZ! NOW I DON'T WANT TO PLAGARIZE!!! So, I got this information from wikipedia. Memorial to Charlie Parker at the American Jazz Museum at 18th and Highland in Kansas CityKansas City Jazz in the 1930s marked the transition from big bands to the bebop influence of the 1940s. In the 1930s City Boss Tom Pendergast was at his height of his power and left Kansas City a wide open town in which night clubs were allowed to remain open from dusk to dawn. In this venue, an era of musical improvisation developed in which it was not uncommon for a single "song" to be performed all night by competing performers who passed through the city. The era ended in 1936 when producer John H. Hammond began signing Kansas City talent and transferring the acts to New York City. In the 1970s Kansas City attempted to resurrect the glory of the jazz era in a sanitized family friendly atmosphere. In the 1970s an effort to open jazz clubs in the River Quay area of City Market along the Missouri ended in a gangland war in which three of the new clubs were blown up in what ultimately resulted in the removal of Kansas City mob influence in the Las Vegas casinos that was partially depicted in the movie Casino (movie). P.S. I'm the last person in my family going to bed. I'm usually the first. The project did not take me long, the uploading has. I cannot figure out how to upload the photos with Craftster! PLEASE HELP! COMMENTS AND CRITISCISM GREATLY APPRECTIATED!!! I love your inspiration AND the box! Sometimes I take my rings off when I play ("play" -- haha... I try to play) and a box like this would be super cute for that. Thankyou! And thankyou so much for fixing it for me! How did you do it? I'll PM ya about the code/Flicker so I don't muck up your thread. 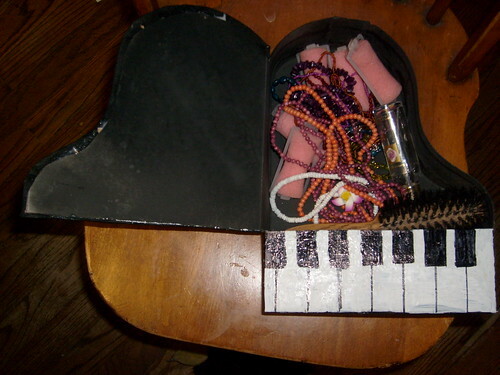 Oh wow, did you make the box or buy one piano shaped? I made the box out of a cereal box. Oh my goodness, brilliant! We should have a separate category for 'best use of humble materials' because that is really cool! Thankyou so much sparrowowl! I really appreciate it! Thanks to everyone for the kind comments! Sure! I'll lend you the template. I don't have it anymore (someone threw it away). 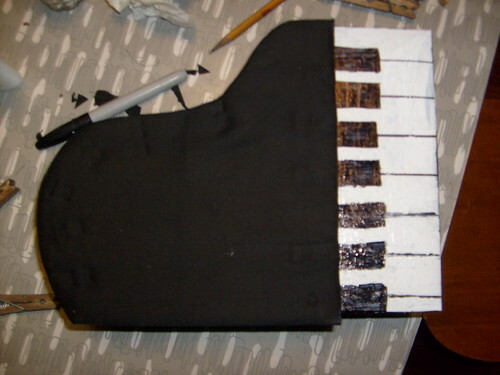 You just make a piano like design on your cereal box. Cut it out with a razor blade but don't cut the side! Do this on the back side 2 BUT only cut the top!! You'll notice that you kind of have 2 long sides. 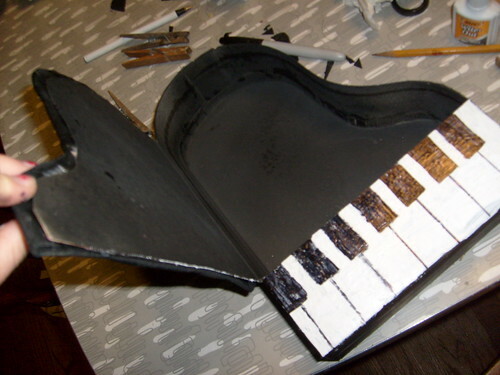 fold these over on your piano design. CLAMP! paint. okay... i don't really know how to explain this. =0 Sorry.. I like your KC jazz tribute. I live in Kansas City, KS and was skimming through all of these specifically looking to see if Kansas or Kansas City were represented. I wasn't 100% sure this was Kansas City, but I figured it could be. Yay for you and the Topeka monopoly! Thanks! I was also hoping there was Kansas City threads. Kind of sad there wasn't as many as I'd hoped!